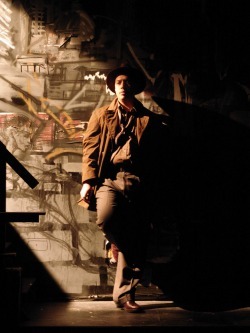 From November 2005-February 2007, I worked closely with Black Rep Artistic Director Donald W. King to adapt Kevin Young's book of "noir poetry", Black Maria, for the stage. Below are my dramaturgical notes from Black Notes program 'zine for Black Rep's February 2007 production of Black Maria. Donald King first spotted the book Black Maria in the Brown University Bookstore. Although they warn not to judge a book by its cover, in this case the arresting and seductive cover was a good indication of content – upon reading the first few pages of Kevin Young’s “film noir in poems,” Donald was blown away in the aisle. “This book would be perfect for Black Rep!,” he thought. Film noir places characters in situations that explore the darker side of life both literally – through an world of shadow and harsh contrast – and figuratively, through moral and social transgressions. Yet in spite of its concern with urban situations, disenfranchised individuals, and social dystopia, African-Americans rarely appeared in classic noir films. By re-imagining the classic film noir with an African-American femme fatale at its center, Young had written a Black noir – a “noir noir” – which spoke directly to Black Rep’s mission to interrogate and re-frame American grand narratives that inform our national mythologies about race, class, culture, and history. After several readings, the first impression held up – this was a great book. But would it work onstage? To find out, we spent two weeks workshopping the piece in December 2005, with a composer, Paul Austerlitz, a production designer, Kyla Coburn, and some talented members of our acting company. We pared the “script” down from the original 79 poems to about 50. We had a wonderful vocal workshop with master teacher Thom Jones, who helped us figure out how to bring the poetry to life. At the end of the two weeks we invited an audience in to see what we’d been working on. Their enthusiastic response told us what we needed to know – yes, Black Maria would work onstage! When we decided to slate a full production for this winter, we knew we faced challenges inherent in staging a book of poetry – the book had no obvious dramatic action, no dialogue, and a fluid approach to chronology. The creative team evolved to include a movement consultant/choreographer, Stephen Buescher, a new composer/sound designer, Nathan Leigh, a lighting designer, David Roy, and of course, Young himself. This talented group, in collaboration with the four actors, helped director Donald King achieve his vision of bringing Young’s striking language to the stage. Along the way, we were very fortunate to garner the support of the National Endowment for the Arts and the LEF Foundation, both of whom make a point of supporting new work and collaborative projects such as this one. In the re-imaged noir Black Maria, Young and King ask us to consider a version of the underworld that hasn’t been whitewashed by Hollywood or Broadway. You might experience this “noir noir” as an often confusing, seemingly illogical series of twists and turns. Is there an arc? What’s the central conflict? How will it all end up? But in the real shadows of our American cities, the dark twists and turns don’t often add up to a an “aha!” moment when all the pieces fit together. Rather, the record is stuck, skipping on “conflict,” and never playing logic, justice, and resolution. Instead of being released by the end of the story, we must confront the idea that the cycle of violence, addiction, fear, and injustice will always continue for those who dwell at the margins. At the same time, Black Maria reminds us that in the midst of all this darkness, flashes of seduction, connection, and redemption seem even brighter and more vital.